No Rules – Heads Up – Outlaw Funny Car Racing! It had been decades since an event like this had been hosted, specifically showcasing Funny Cars and with a no rules, completely outlaw, run what you brung rules package. Any body style, any engine combination is permitted at Funny Car Chaos, as we emphasize the entertainment value and character of the most popular and identifiable drag racing vehicle on the planet, Funny Cars. Huge burnouts, dry hops, back up girls, Funny Car Chaos has it all! 24 Car Field of Outlaw Funny Cars! 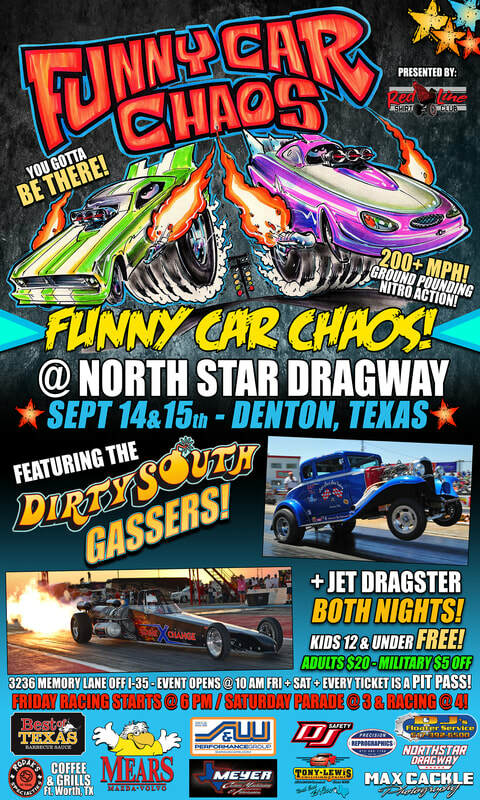 + Dirty South Gassers & Jet Dragster! Kids 12 & Under Free! Parking Free! Military $10 w/ID! Every Ticket is a Pit Pass! Dirty South Gassers Close The Show!